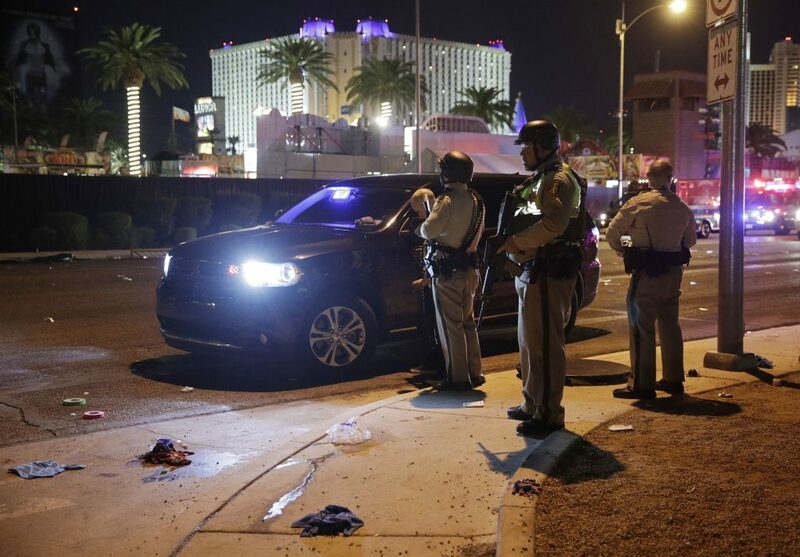 LAS VEGAS — In what now ranks as the worst mass shooting in modern U.S. history, a gunman on the 32nd floor of a Las Vegas Strip casino opened fire on an outdoor music festival Sunday night, killing more than 50 people — including two off-duty police officers — and wounding more than 400, according to latest official reports Monday. UPDATE 7:30 a.m. MDT: FBI hotline and resources for family and friends of those who may be affected by the incident added. See sections at close of report. (Metro Police news release.) Updated video substituted top of the report. 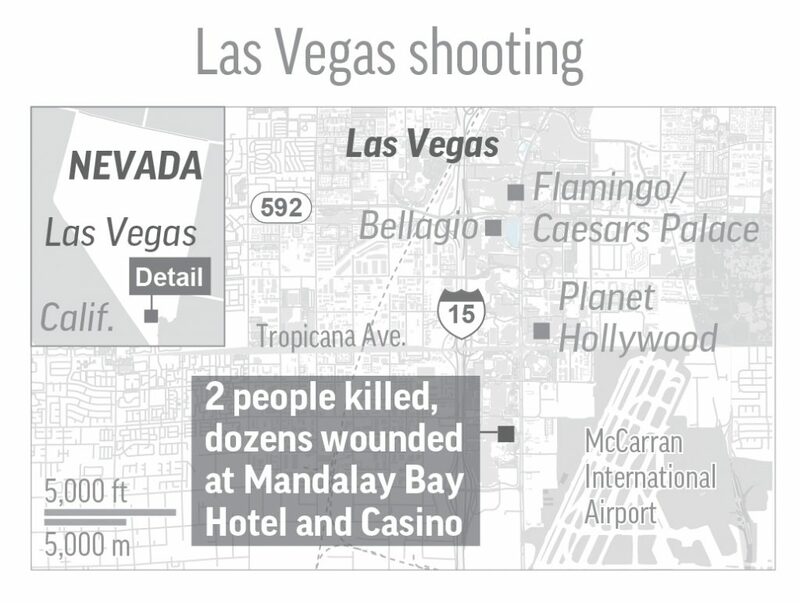 Country music star Jason Aldean was performing before a crowd of more than 22,000 attending the “Route 91 Harvest Festival” concert Sunday when a shooter opened fire on the crowd from his hotel room on the 32nd floor of the Mandalay Bay Hotel at around 10:08 p.m. PDT. 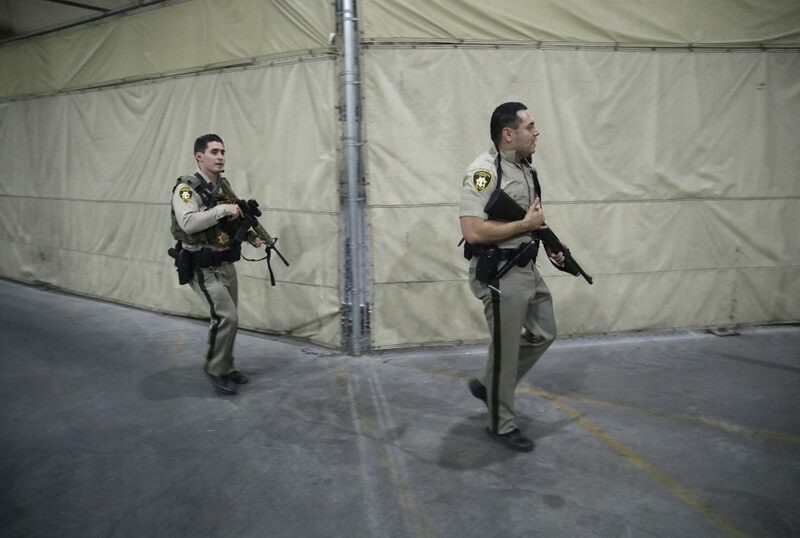 SWAT teams quickly descended on the concert and the casino, and officers used explosives to get into the hotel room where a man later identified as Stephen Craig Paddock, of Mesquite, Nevada, was found inside dead. 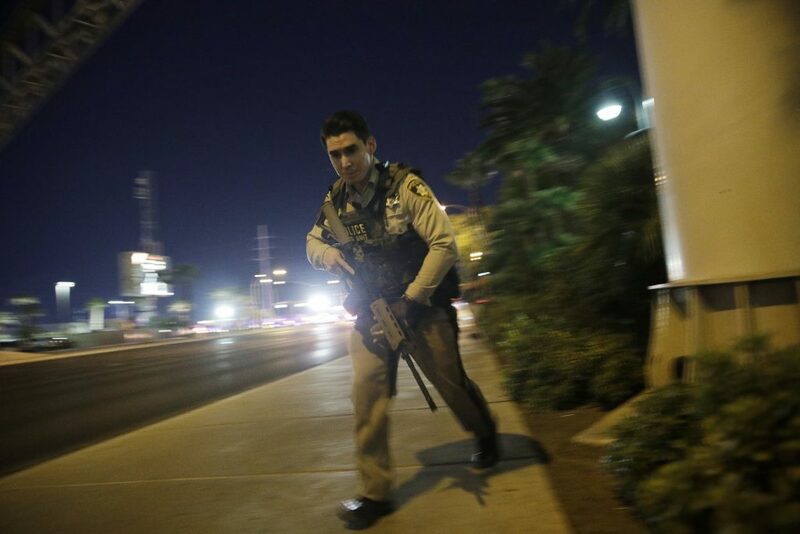 “LVMPD SWAT responded to the call, breached the hotel room and found the suspect dead,” Metro Police confirmed in a news release issued around 5:30 a.m. PDT. A motive was not immediately known. Lombardo said Metro Police believe this was a “lone wolf” attack. In a brief interview with the Orlando Sentinel, Eric Paddock, the brother of the shooter, said he’s “completely dumbfounded” and can’t understand what happened. He also said he’s made a statement to police. In an early Monday morning news conference, police stated they were looking for a roommate of the dead suspect as a person of interest. That person, Marilou Danley, 62, was ultimately located by police within an hour or two. 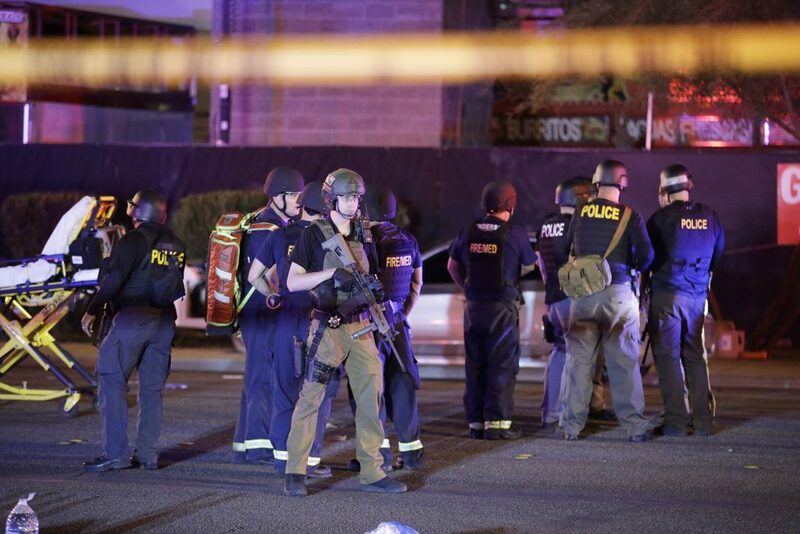 The Clark County Fire Department estimated that approximately 406 people were transported to area hospitals and 50 are dead following Sunday evening’s shooting, Metro Police stated in a Monday morning news release. There were two slain off-duty officers who were attending the concert, Lombardo said in his first press conference Monday. One of those dead was a Metro Police officer whose name has not been released pending notification to his family, according to the department’s later news release. 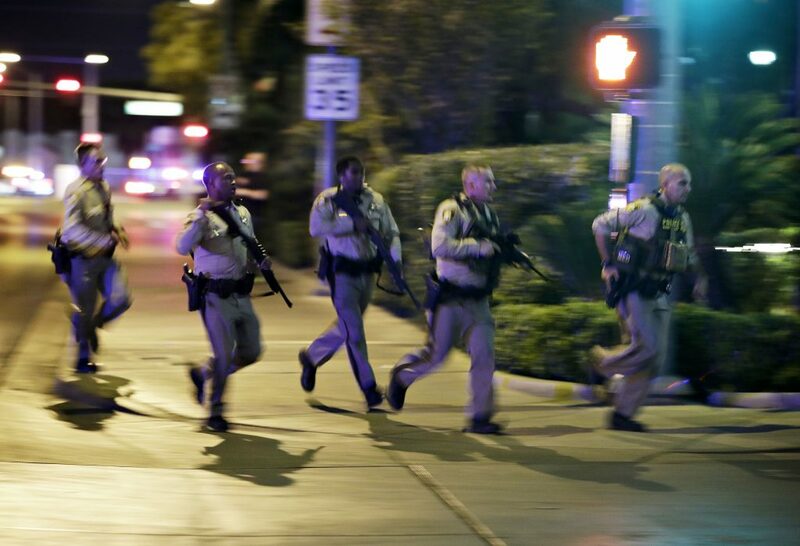 As well, there were two on-duty LVMPD officers injured during the shooting, Metro Police tweeted at 4:30 a.m. PDT. “One is in stable condition after surgery and the other sustained minor injuries,” the tweet stated. 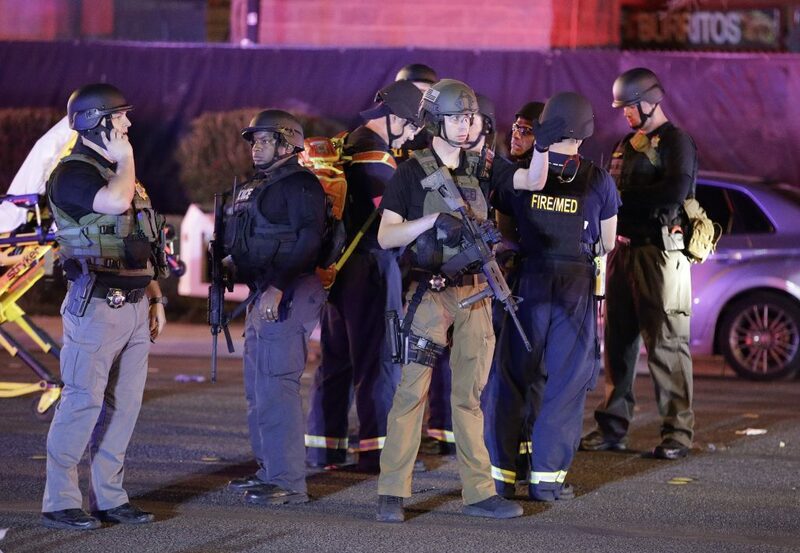 Several officers from California were attending the music festival, according to The Associated Press. 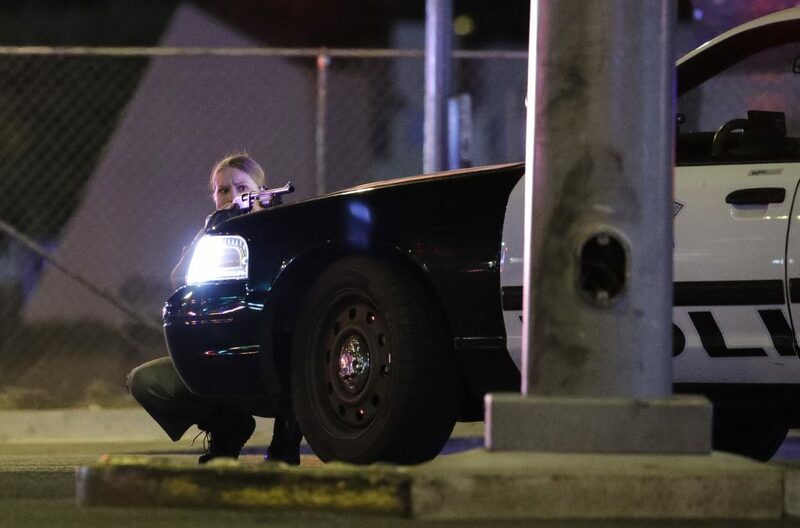 A Bakersfield police officer was shot and taken to the hospital with nonlife-threatening injuries. 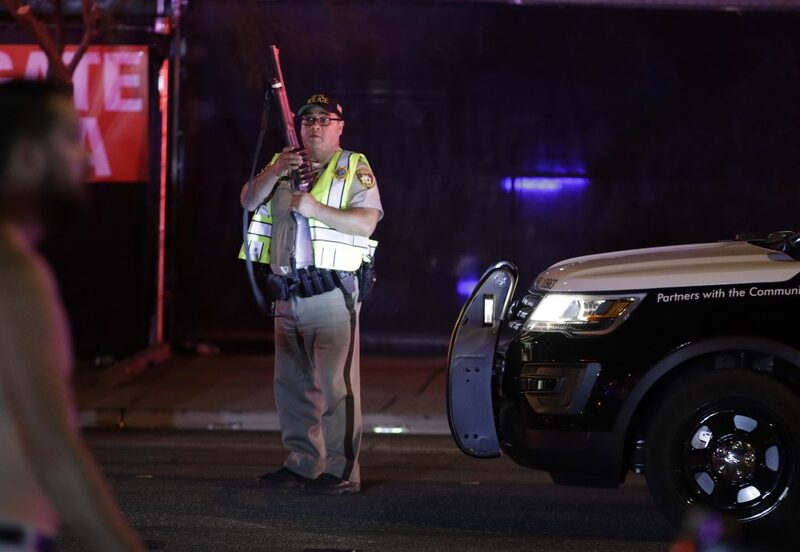 The Los Angeles Sheriff’s Department reported two of its off-duty members were shot during the attack, both sustained nonlife-threatening injuries. Resources for those offering or seeking information on family or friends who may have been affected by the incident are included below. Aldean was in the middle of a song when the shots came rapidly: Pop-pop-pop-pop. Video of the shooting then showed Aldean stopping and the crowd getting quiet as if they were unsure of what had just happened. The gunman paused and then fired another volley of muzzle flashes from the gold glass casino as more victims fell to the ground while others fled in panic. Some said they hid behind concession stands and others crawled under parked cars. Kodiak Yazzie, 36, said he and his girlfriend were watching Aldean’s performance when he heard what sounded like fireworks. 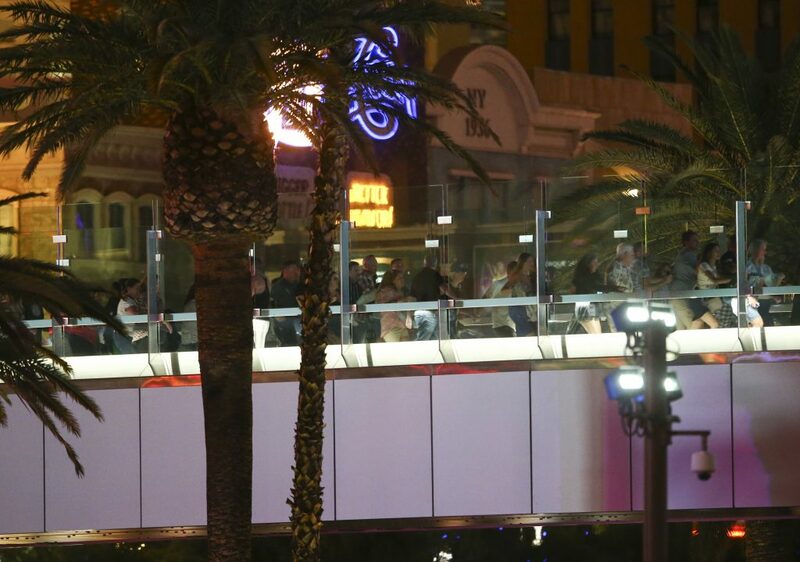 Jose Baggett, 31, a Las Vegas resident, said he and a friend were in the lobby of the Luxor hotel-casino — directly north of the festival — when people began running. He said people were crying and as he and his friend walked away, they encountered police checkpoints where officers were carrying shotguns and assault rifles. 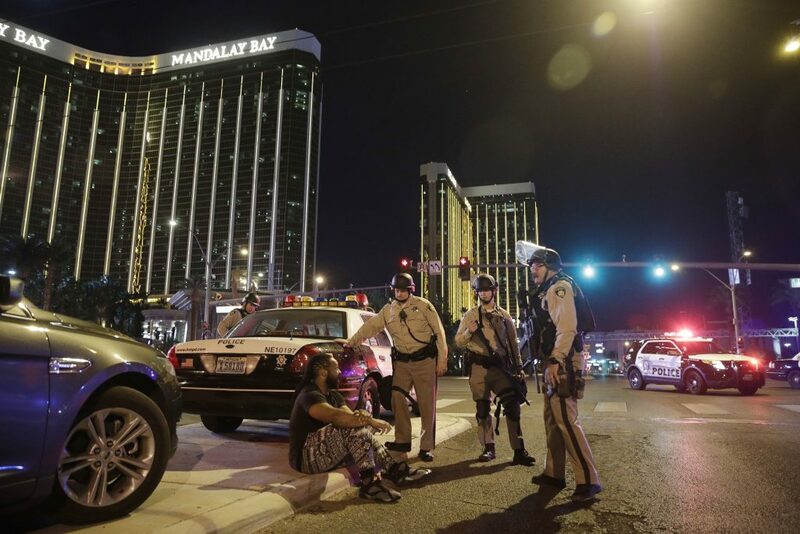 “There were armored personnel vehicles, SWAT vehicles, ambulances and at least a half-mile of police cars,” Baggett said. 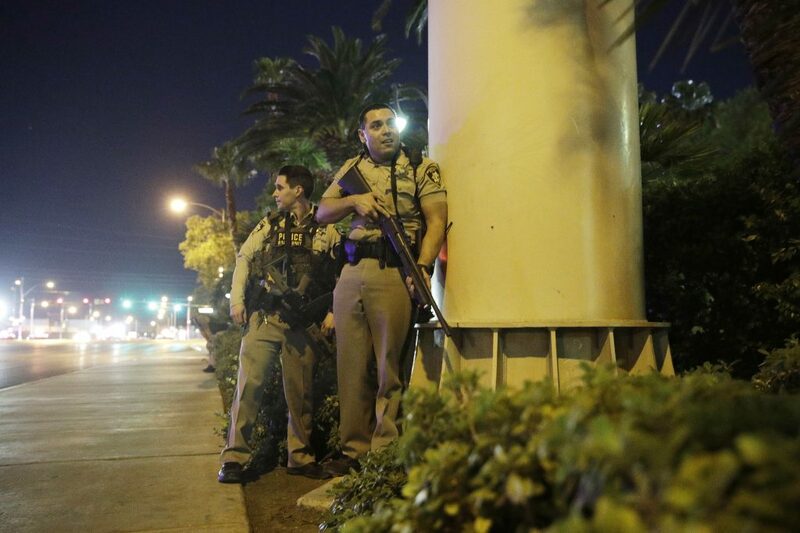 Authorities shut down part of the Las Vegas Strip and Interstate 15. 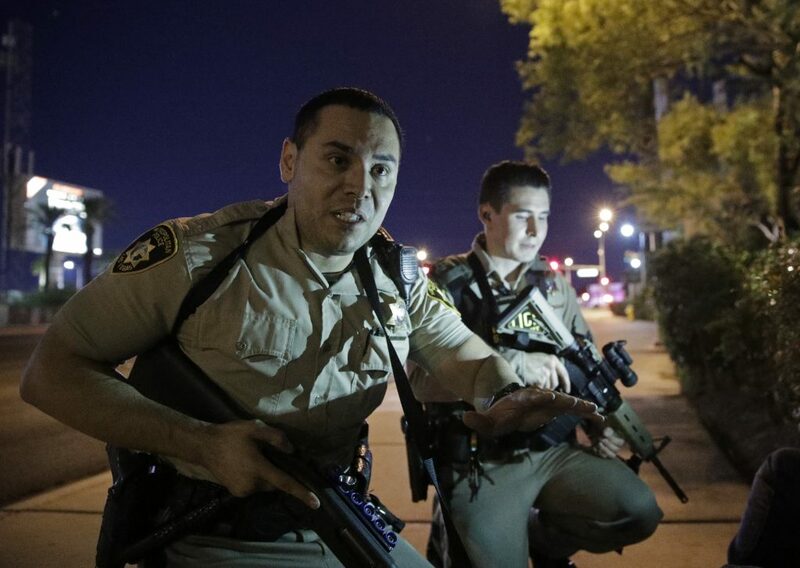 According to a tweet by Las Vegas Metro Police at 2:14 a.m. PDT, 3:14 a.m. MDT, freeways had been reopened for thru traffic, although the eastbound off-ramps from Sahara Avenue to Russell Road remained closed at that time. 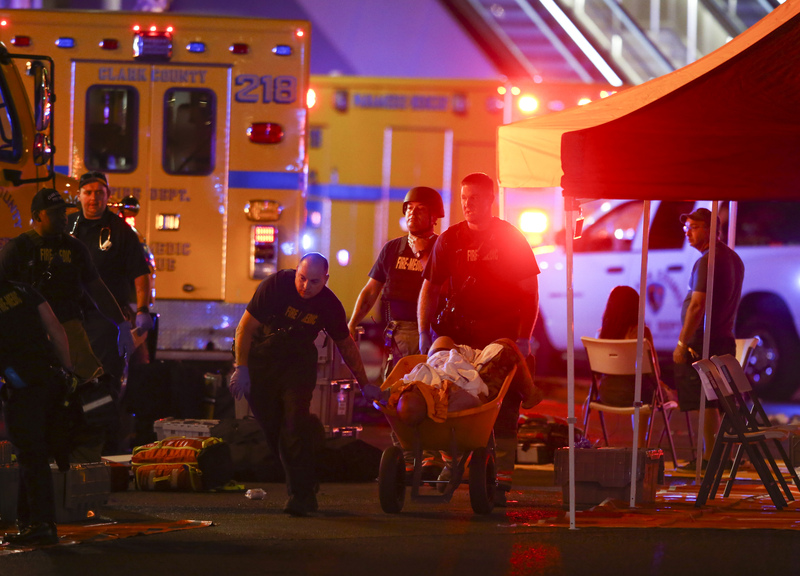 Flights were temporarily halted at McCarran International Airport because of the shooting, the airport said on its verified Twitter account. Although limited flight activity had resumed by 12:47 a.m. PDT, 1:47 a.m. MDT, the airport tweeted just before 2 a.m. PDT, 3 a.m. MDT, that nearly two dozen flights were diverted to other airports overnight. Those scheduled to travel Monday morning are advised to check flight status with their airlines. The Federal Bureau of Investigations is asking for anyone with videos or photos concerning the shooting to call 1-800-CALLFBI or 800-225-5324. The Metro Police Department and Clark County Coroner’s Office have set up a hotline for family or friends to report a missing loved one connected to this incident. The hotline is only to take reports on missing people and may be reached by calling telephone 866-535-5654. Metro Police also opened up a family reunification center at its headquarters at 400 S. Martin L. King Blvd. in Building B, Las Vegas. The identification process of all of the injured and the deceased will take time, so authorities are asking the public for patience. 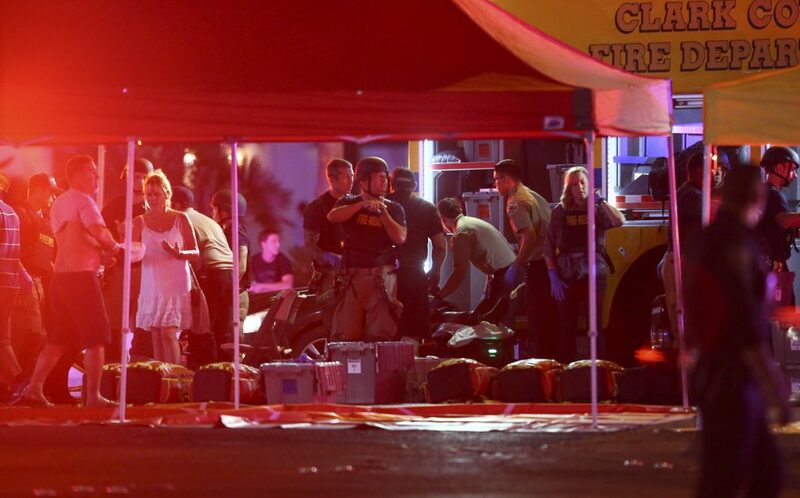 Before Sunday, the deadliest mass shooting in recent history in the U.S. happened June 2016 when 49 people were killed by a gunman at the Pulse nightclub in Orlando. SALLY HO of the Associated Press contributed to this report. and Copyright 2017 The Associated Press as to AP contributions. All rights reserved. This material may not be published, broadcast, rewritten or redistributed. Horrendous. Thoughts and condolences to the victims and their communities and the thousands of concert goers who endured this senseless slaughter. my wife and I were there. Thank God we left hours before the shooting! I hope none of the great people we met got shot! Maybe Americans need to quit focusing on what Muslims, Mexicans and Blacks are doing. Everyone is a suspect in my book! GO FALCONS! 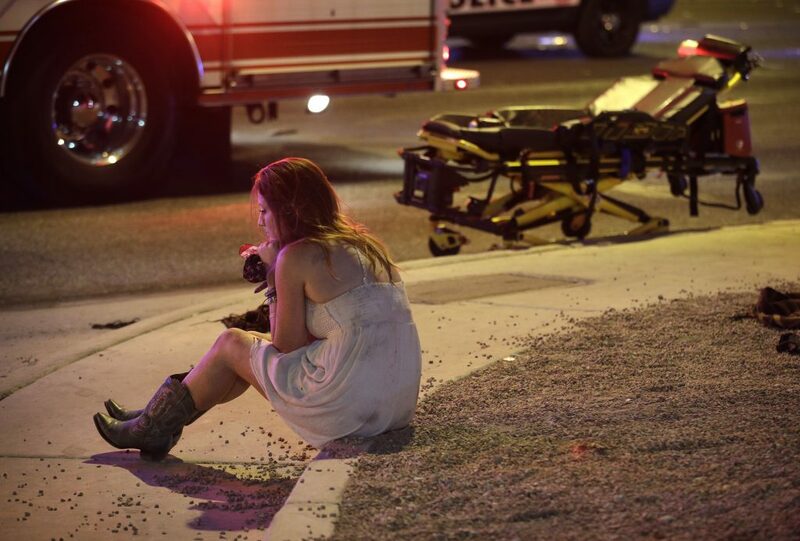 America needs to focus on “all bad elements” of society whether it is a lone shooter, Muslim terrorists, and / or illegal aliens bringing in guns, terrorists and drugs. America need not ever quit focusing on any bad element! This is going to change American consensus reality. My condolences to all the victims. This is a wake up call. The fabric of society is weakening. This is a symptom. You can call it evil, perhaps a one man agenda going off the deep end due to brain chemical imbalance, but whatever the cause, how can we as a group of people under one nation, change this trajectory. Or is it the new norm? I am not the first or will be the last to say this, but if you watch the 24 hour news cycle, it makes you literally depressed, if not angry at times, or further , feeling disillusioned, hopeless and divided. It is a non stop soundtrack. Hate and negative emotions are on the rise these days, and it is projected into our living rooms. I blame the media circus for creating this division. THE INTERNET is just an amplifier. Oh America, you are under seige. There is no excuse for anyone doing something like this, but you can bet that the hateful liberal media contributed to the situation and it’s reason for occurance. America will never be same as it was when we were younger. Millennials are self-centered and disrespectful all due to social media and the liberal Hollywood television shows portrayal of society. The world is now a scary place due to media sound-bites and misrepresentation of what is really the truth. Anything for a story or votes. Sad what we have become. My sincere condolences to all of the families for their loses, and to those have been injured. The 20-30 year old millennials provoked a 64 year old baby boomer into a mass shooting? Gotcha. Liberal media…read the big words there. The mind is a terrible thing to waste. My mistake professor. Follow up question: Liberal media are provoking mass shootings how? Also, if I may, which media would be the liberal media and where should I go for the “straight scoop”? Your illogical jabbering is proof that your mind was already wasted. I agree. Many on the far right will fight it, but the time has come. Fully automatic weapons are only good for one thing. hey I see you snuck out of your play pen ! I think there may be a potential need to talk about that issue but we don’t have enough information yet. 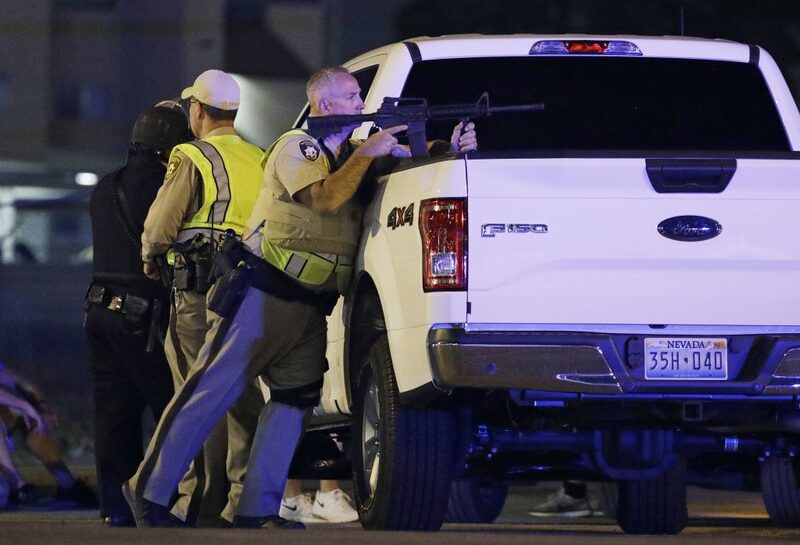 We know he had one fully automatic weapon but we don’t know the legal status of that gun at the moment. Once the officials finish their investigation we’ll have an idea about the situation that led up to this massacre. We are getting away from the fact that many people were killed and hurt. That is a very sad fact. Now all of the gun control and gun rights’ activists on both sides will come out of the woodwork. Everyone will talk about who and why, and banning automatic weapons, but the truth is if someone wants to kill people, they will use whatever means necessary to accomplish their goal to do so. Do we ban cars when someone drives into a crowd or parade and kills scores of people and hurts many others? They can always drive into a crowd with a vehicle loaded with bombs… there are always ways. The media creates most of the issues by what they say and do. No one says ban the media, but they should have to abide by the truth in reporting. Political correctness is fanning the fires, and I suspect that it will get way worse before it gets better.